This page will provide you with information about having an ACL reconstruction procedure. For further details, please speak to your consultant. The anterior cruciate ligament, or ACL, is one of the key ligaments in your knee joint that gives it stability. If this ligament is torn (ruptured) it can cause the knee to collapse or ‘give way’ when you make twisting or turning movements. How does an ACL rupture occur? A tear or rupture to the anterior cruciate ligament can happen as a result of a twisting injury commonly associated with skiing and playing football. Other parts of the knee can also be injured at the same time; these include damaging the joint surface and tearing the cartilage. A successful ACL reconstruction should ensure that your knee no longer gives way. It will help you to be more active and hopefully resume some or all of your sporting activities. Alternatives to surgery include wearing a knee brace or performing exercises from your physiotherapist to improve the co-ordination and strength of your thigh muscles. An ACL reconstruction takes approximately an hour to an hour and a half with an assortment of anaesthetic techniques available. One or more cuts will be made around the knee by your surgeon. They may opt for keyhole surgery (arthroscopy) where a camera is used to look inside the knee. 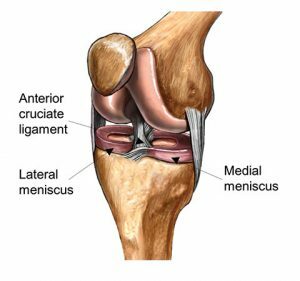 The anterior cruciate ligament will be replaced with an appropriate piece of tissue from another part of the body. It will be secured by fixing its ends into the bone with special screws or anchors. In general, you should be able to go home the same day or the day after the operation. You may be required to wear a knee brace for a few weeks following the ACL reconstruction. Intensive physiotherapy will begin once your knee has started to heal and could continue for as long as six months. With the help of regular exercise you should be able to resume normal activities as soon as possible. Remember to seek advice from your GP or healthcare professional before starting exercise. Your knee may never be quite as good as it was before you sustained the original injury. An ACL reconstruction helps offer more stability if your knee continually gives way after an ACL rupture. This is beneficial on a daily basis and improves your chances of resuming sporting activities that may not be possible without an ACL reconstruction. Price for this procedure from £5015.